As most collectors can attest, when dealing with cards, situations regularly arise where a few cards, or a whole set of cards, need to be safely and conveniently transported. Regardless of intent, stacks of cards never seem to stay in place. Cards can slide and bend, and those fragile corners are subject to unnecessary abuse. They may not always be high-value cards, but that does not mean that collectors should risk damage. 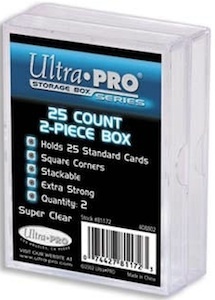 The two-piece polystyrene boxes from the Ultra Pro Storage Box Series fill that need. These strong slider boxes are great for simply transporting cards across town for a trade or even for shipment of cards across the country. 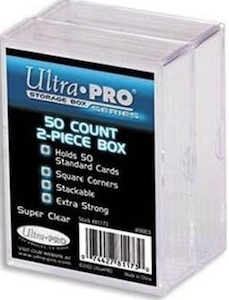 I personally like using the storage boxes when I am opening a new box of cards and don't have time to sort and put the cards into pages or toploaders immediately. I can just place all my base, hits and inserts cards into one of the boxes, and then I know they will be protected until I have time to organize them. One key thing to note while transporting cards is that the storage boxes work best when completely filled. Any space left in the case will allow the cards to move, risking damage. Also, the listed maximum for cards held by the case is not a challenge. 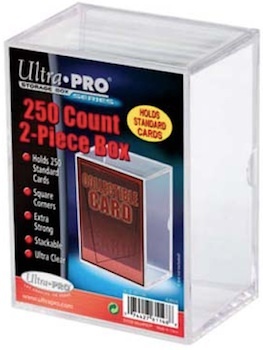 Exercise judgment when filling the case and stop when it appears full, even if more cards are technically able to fit. The line of storage boxes are all basically the same and can be distinguished by the amount of cards they can carry. The share several common features. Square Corners - These corners allow for a tight fit, limiting card movement from side-to-side. 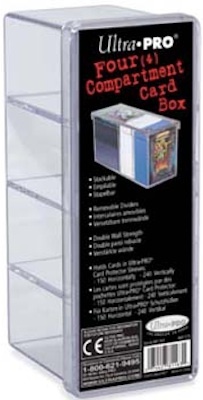 Stackable - The cases all feature recessed topps and small pegs on the bottom of the case for optimum stackability. Air-Tight Closure - The cases all posses a tight seal which protects cards from drafts and humidity. 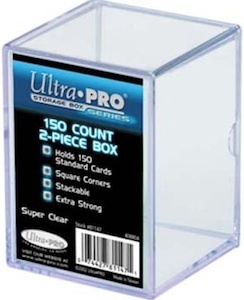 One unique two-piece case of note is the 100-Count Diamond Corner Box. This Ultra Pro case is part of the Display Series. 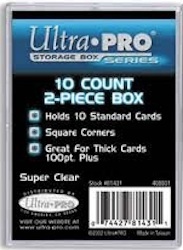 While Ultra Pro already has a basic case that holds 100 cards, this premium product features most of the attributes listed above, as well as several others. Blue-Tinted Plastic - While it does not offer any significant UV protection, the blue tint gives the cards encased a more crisp look. Rounded Exterior Edges - Rounded edges allow for a softer feel when carrying the case, and an overall better grip. Diamond Corners - Just like the Ultra Pro Magnetic One-Touch Cases, Diamond Corners have been added to the case to help protect card corners. 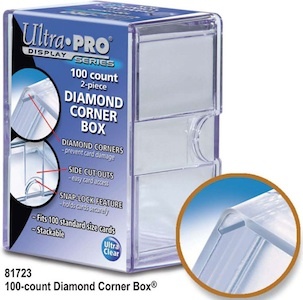 These corners feature a diamond-shaped cut-out design that prevents the corners from touching anything while in the case. Extra Strong - Reinforced with 5mm thick sides for added protection, these hard plastic cases can withstand a decent amount of punishment. Snap-Lock Feature - The Snap-Lock feature allows collectors to confidently trasport their case, while knowing that it will not accidentally come open. The case literally snaps closed and is opened by applying pressure to the small cut-out sections in the middle of the case. Side Cut-Outs - Occasionally cards can be difficult to remove and can even become wedged in the case. 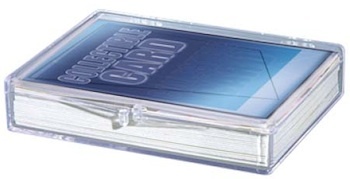 Cut-outs on both sides make it easier to access the cards without being forced to shake the case or take more drastic measures to remove your cards. 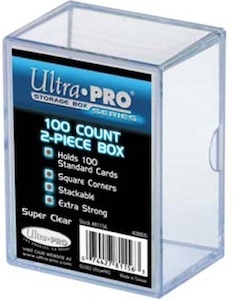 Storage boxes offer a relatively small and efficient way to transport and protect your cards. 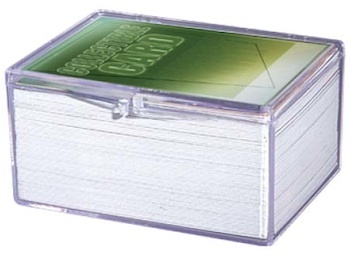 Collectors have case options that range from as few as ten cards, to as many as 250 cards. The following list includes each case and the relevant information. It also features a helpful shopping guide. Can also be useful for transporting individual thick relic cards. Comes with 2 cases per pack. Features several added benefits, which are documented on the Storage Boxes tab . Different box shape than the smaller cases, which stack normally. Cards stack on their sides. Customizable case holds 240 or 150 standard cards, depending on horizontal (150 cards) or vertical (240 cards) card orientation. Features removable dividers, which allows for collector preference to dictate usage, and choose between 2, 3 or 4 compartments. 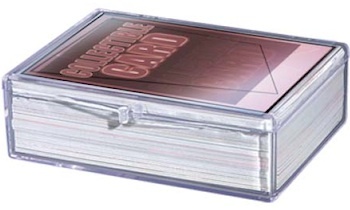 Compartments are large enough to hold cards in soft sleeves. Holds 90 toploaders or 20 snap tights. Can also fit One-Touch Magnetics and screwdown cases. 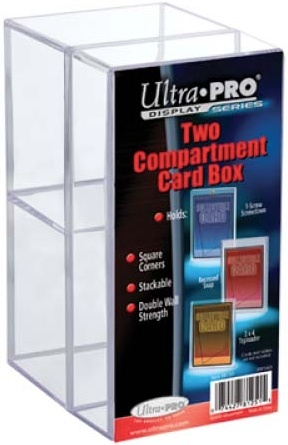 The Ultra Pro hinged boxes offer the same basic function as the slider boxes, but feature snap-lock tops. While they don't offer many of the benefits of the slider boxes, they are also much more budget-friendly, which is why they are a collector favorite. One disadvantage is that the the thin plastic is prone to cracking and breaking. However, the hinged boxes are viewed as a "workhorse" product and the low price allows for easy replacements. The boxes feature a tight fit to reduce movement, so soft sleeves cannot be used with the cards. The tops can be removed for easy display or as sorting trays, which can be ideal for dealers. As an entry-level product, they offer no UV protection and are not recommended for long-term storage. Although not directly relevant to cards, the hinged boxes can be useful for storing and sorting coins, tokens, and other small items. 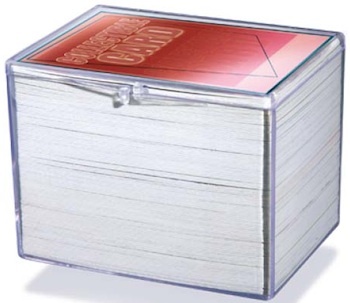 The box sizes range from 15 cards to 150 cards and are identical other than there size. Can also be useful for transporting individual relic cards. Can also be useful for transporting thick relic cards. 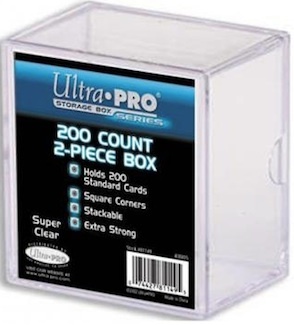 Yes I am looking for plastic or carboard boxes that will hold 50 count sport cards in sleeves. No one seems to carry plastic boxse that would fit what I am loking for. I am giving ny sport cards collection to Non-Profet Org. Like Shirens,chilren hospital and etc. Thanks for any helped you can provide in this matter.